After what seemed an eternity, the shocks became softer, and we were able to gather our neighbors in the yard. We all were uninjured, although all the house ware was broken or damaged. In the darkness of the night, we looked to each other, and felt gratitude to the Lord for the Gift of life. Although authorities said there was no risk of a tsunami was not really a risk, a couple of hours later the ocean broke over the city and the coastal villages. Only two radio stations were on the air, asking people to remain calm, while violent aftershocks went on and on. When day light finally came, we ran around everywhere trying to learn about our faithful, friends and acquaintances who live near us. When, with difficulty we finally made it downtown, a horrible scene met our eyes: the city looked like it had been bombed with crumbled buildings, rubble and debris everywhere. In the afternoon of the same day, something worse than the earthquake and the tsunami happened: sacking, plundering, physical assaults. Supermarkets and stores were plundered by gangs. Prisoners escaped when jails were destroyed in the quake. Fear gripped the population. The police was overwhelmed. I wondered: is this the outcome of so many years of education?… Where are the fervent Christians and the 500 years of so called evangelization of our people? It is the most shameful thing we’ve lived through, an experience worse that the earthquake itself. In a couple of days we were able to communicate with our relatives, faithful and friends in other cities. After three nights of no electricity, no drinking water, no telephones, no internet or television, phone service started to work intermittently, only a few moments at a time. Stores are still closed and plundered every day. No offices or agencies are working, the police are overwhelmed. The government deployed the military in the city and imposed curfew. I began visiting a hospital in downtown Concepcion. There was a total shortage of everything, most of all, lack of health workers… Helping wounded and dying people left a deep impression on me… The urgency of spiritual need made it seem like all were Orthodox. In these circumstances people don’t care what Church comes to comfort and help them, neither do they care about how you pray. It was easy to talk to strangers in the streets, as if we’d always known each other. In the hospital I saw a lady who was in the operating room undergoing surgery for acute peritonitis when the quake began. The surgeon took away the surgical table just before the room tumbled down. She recovered from anesthesia outside under a tree, with her wounds still open. Some patients who underwent heart surgery on Friday almost died of fear. Other people fell down from trees where they had climbed to save themselves, yet others sustained burns, while some were rescued from under fallen buildings. I visited the faithful as much as I could. A lady from Moscow told me “I want to go home….I doesn’t want to stay here”. Many of our faithful are merchants, and their property which the earthquake spared, was destroyed by vandals. 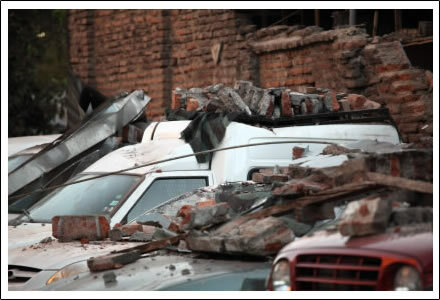 Several of our parishioners have been injured, and they cannot return to their destroyed houses. Fortunately our community in Santiago and the faithful in Valdivia are much better than we, because the earthquake there wasn’t as bad. The earthquake came when we were in the process of legalizing a piece of land, donated to our mission for the first Orthodox Church in this city. The facilities we used for our liturgical services are damaged, and for a while, if possible, we’ll celebrate in a school in the same area. The city still endures at least 15 terrifying aftershocks daily, some reaching a seven point magnitude. It seems that the earth is accommodating itself in its bed. After several days of complete inactivity, some stores began to offer a small number of products, but at very high prices. Chile is a long and narrow strip of land, and if highways are unusable, food supplies are uncertain. For more than 10 days we didn’t have any drinking water. Fortunately, on the hills there are water springs and those living near the hills could get water there. When the city began slowly began to return to normal, sanitary emergencies surfaced: garbage accumulated everywhere, without electricity food perished in refrigerators, etc.. Currently, we are getting ready to deal with two other emergencies: post traumatic syndrome, and the absence of jobs. The income of the educational institution I work at depends on student tuition. Most students come from the working class, and their situation is dire. More than 20,000 companies have been destroyed. Lack of jobs is our main concern, because the Orthodox mission and my family are barely able to make ends meet with my salary, and now the prospect is worse than ever. Within this catastrophe, the concern and the human and spiritual sympathy of our Metropolitan and our Bishop John of Caracas and South America, (we pray their years should be many) gave us great comfort, as well as the love and concern of Saint Nektarios community in Santiago, the communications from the Fund for Assistance to our Church. The spiritual support from Jordanville, and the fatherly nearness of several brother priests who have got in touch with us. Our hearts are full of joy and thankfulness to God for giving us life and for allowing us to serve His Church. May the Lord reward our Archpastors, brothers and sisters for their love and sympathy in this time of grief, this time when the ground is still shaking. Please support the Haiti mission!